auch selber erstellen. Erinnert teilweise an HijackThis (EFB-Suche). of locations where unwanted software has a known record of appearing or leaving traces. when you reboot your computer, your browser's plug-ins, your home page setting, etc. Here you can find more information about some of the files in FreeFixer's file database. Currently there are 86144 files in the database. ist inzwischen bei v. 1.08 und hat (nach eigenen Angaben) mehr als 90.000 Dateien in seiner Datenbank. Inzwischen kann man kontinuierlich überwachen, auch Browser-Erweiterungen und Search-Provider scannen. aktuell bei v. 1.10, weniger Fehler und u.a. FreeFixer will now list all TCP Listening Ports on the machine. To reduce the noise in the scan result, most of Microsoft's TCP servers are whitelisted and does not appear in the scan result. FreeFixer now supports Windows Server 2016. FreeFixer now lists extensions for the "Mozilla Firefox ESR" browser. Fixed bug where some Firefox add-ons in the .xpi format could not be unpacked. Fixed bug where registry values of type REG_MULTI_SZ were not parsed correctly under some conditions. Fixed a bug where the Memory Compression Windows process appeared in the scan result without a file path. FreeFixer will now also list UDP Listening Ports on the machine. FreeFixer now sends the port number, protocol identifier and (TCP/UDP) and version (4/6) to the FreeFixer web site when clicking on the more information links shown in the TCP/IP Listening Ports scan result. Added the following ports to the list of known ports: 123 (ntp), 138 (netbios-dgm) and 500 (isakmp). The file information pages will now show if the process is listening on a TCP or UDP port. See CDPSvc.dll as an example. Whitelisted port 123 on Windows 10 and port 3540 on Windows 7 in the UDP Listening Ports scan result. 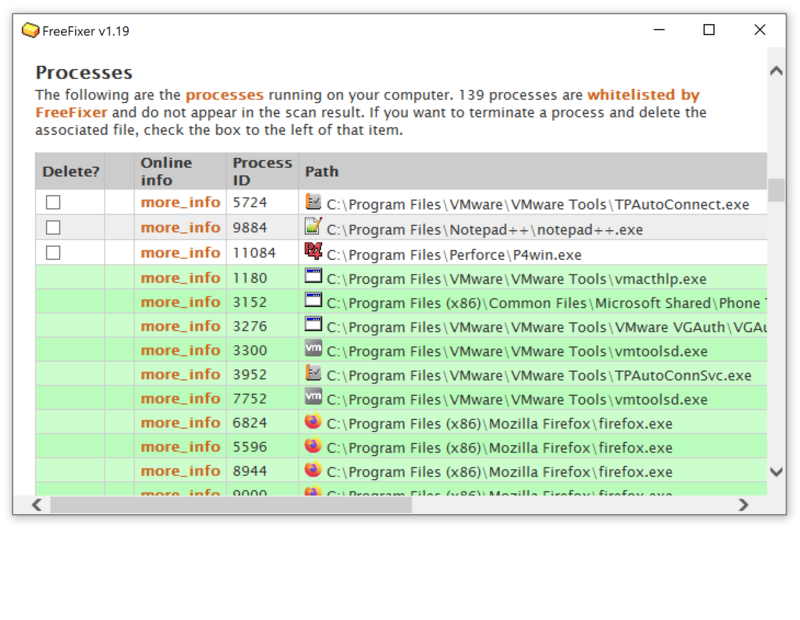 Memory usage improvements when FreeFixer scans for recently modified or created files. FreeFixer now support Windows Server 2019. On Windows Server 2019 the IEPlugin now suggests to set Default_Page_URL to "res://iesetup.dll/HardAdmin.htm" if the default value has been changed. Fixed bug where clicking the more-info link for "HKCU/../Default_Page_URL" returned an error.